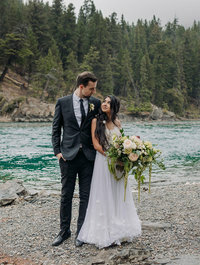 Moraine Lake elopements are some of my favourite, especially when it’s a true elopement – just the couple getting married. No guests. No chaos. Just two people in love that want their day to be all about them. It’s the best! We had a small hiccup waiting for Tayler & Jake’s wedding to happen. Once again the bears in the area were following me and the road was closed to Moraine Lake (I was lucky I got in early when I did) and I was wondering where the officiant, the wedding planner & the couples were. There’s no cell service at Moraine Lake so there was no way to get a hold of any one either!Luckily the road opened up after the bears moved a long. We hiked the rockpile and found a semi-secluded spot (you’re never really alone at Moraine Lake. In fact a bit of a group formed behind us as random strangers felt the need to photograph the ceremony. No, I’m not joking.) and started the ceremony. It was short and sweet and heartfelt.The rain started to fall shortly after and that didn’t phase Tayler & Jake… we rolled with it and the rain added a definite romantic feel! I really do enjoy Moraine Lake elopements, but it is a tricky place to plan to go and there are always people around, no matter what the photos show. For Morain Lake Elopements, either plan to do very early in the morning or very late in the evening and try to avoid July & August because that’s when it’s the busiest. I have lots more Moraine Lake elopements on my blog, so definitely look for more! Are you newly engaged and thinking about eloping? I would love to photograph more Moraine Lake elopements & I have special Moraine Lake elopement packages! 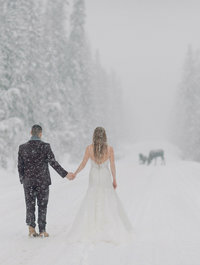 Please get in touch for more information on weddings & elopements in Canmore, Banff, Lake Louise, Moraine Lake, Emerald Lake and other mountain destinations. If you aren’t in the market for a Moraine Lake elopement, I also do couples, anniversary sessions & proposals! 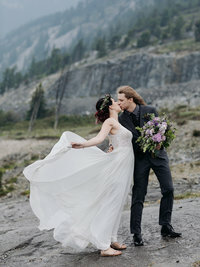 Looking for more intimate mountain wedding and Moraine Lake elopements inspiration? Check out this Lake Louise summer wedding! Check out this intimate Lake Louise wedding! Or this intimate Tunnel Mountain Reservoir wedding! Or this Tunnel Mountain wedding! 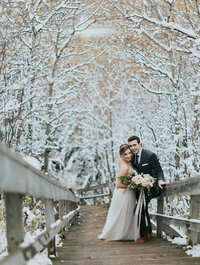 Or this Canmore intimate outdoor wedding!